I think of it every year about this time, especially when October comes around and we’re still looking at warm temperatures here in Texas. 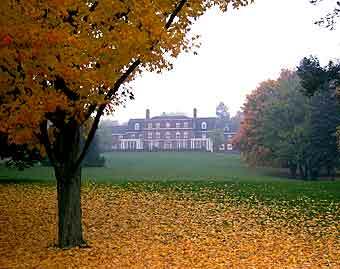 For spending three years in New England during seminary, I was always struck by the beauty of fall in that very different part of the world. 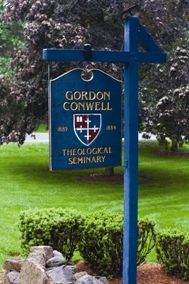 Perched upon the highest hill in Essex County some thirty miles from Boston, Gordon-Conwell Theological Seminary has a commanding view indeed, with the Atlantic Ocean just ten miles away on one side, and the nascent beginnings of the Berkshires and White Mountains on the other. And created out of a former Catholic monastery and great house on the North Shore, the buildings and grounds are simply spectacular, no matter what the season. It is in the fall, however, that the surroundings put on their best show, as a cacophony of colors compete to assault the eyes with red, orange, yellow and purple hues of every shade. How odd it is, though, that the enormous beauty that comes each year in autumn is actually produced by the death of the leaves, as the shortening days reduce the light and water that is needed for their photosynthesis. For it is only the dearth of chlorophyll, the chemical that gives plants their green color, that enables us to see the yellow and orange colors that have actually been there all along. Likewise, in trees such as maples, when photosynthesis stops, the glucose which the trees have produced is then trapped in the leaves, turning into the bright reds and purples that are so striking to the eye. It is thus the combination of all of these things that produc es the beautiful foliage that tourists from around the world will fly to Boston, and then actually sit in traffic jams on two-lane country roads for hours, just to see each year. All of which is a reminder that sometimes even out of difficult and death-like experiences, beautiful things can come–unexpected possibilities, in fact, that can both delight and enrich those who are ready to see them. When we face such times in our lives, thus, perhaps that’s the time to ask God to open our eyes to see the fuller picture that He sees. After all, the whole Christian enterprise began in a cemetery when everyone assumed that death had managed to have the last word after all. Everyone was wrong. And thanks be to God for that! Thankyou for these lovely thoughts. We are looking forward to a trip “Up East” very soon.